Acting Balanced: Bull Riding, Babies and Romance.. Oh My - Check out the latest from Harlequin Romance! Bull Riding, Babies and Romance.. Oh My - Check out the latest from Harlequin Romance! As a Canadian ex-pat living in the US, I am hyper aware of finding our national symbol when I am out and about (and yes I put that in there for all of you Americans thinking that I am saying oot and aboot...) and it's even more fun when the symbolism comes in as nice a package as one of the latest releases from Harlequin Romance - one of four revived titles by one of my favorite authors, Tina Leonard. Check out Zane Lambert, who lives in Alberta, Canada but is originally from Manitoba and is on the cover of the fourth book in the re-released series, available only at Walmart! Harlequin Pro Bull Riders stories are heartwarming contemporary tales of everyday women finding love in the arms of the quintessential American icon, wrapped up in manliness and romance. The stories showcase the charm of small-town America and the ruggedness of Western locales and regularly feature Western characters as protagonists. 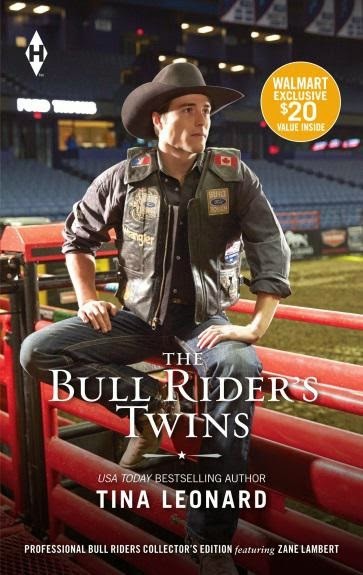 Each book contains exclusive content, including biographies, interviews, photos, signed reader letters from the riders and $20 of value-added coupons for select PBR events, fan club membership and upcoming Harlequin titles. You can check out the first chapter of all four titles and print coupons to save $1.00 each!